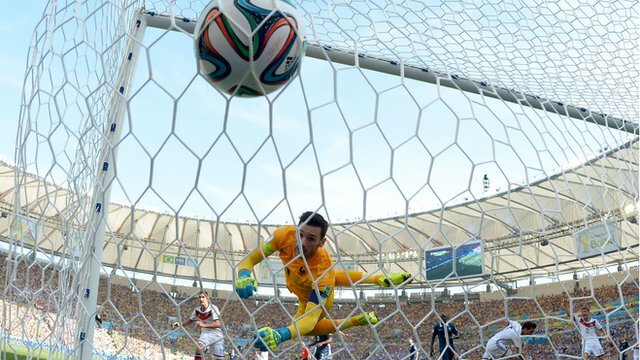 World Cup 2014: France 0 Germany 1, France Lost Cause of White Fortune of German? France defeated by Germany with Mats Hummels goal. France must be disappointed with the result contrary to German Squad. However the result quite make me wondering Did France Lost because they are wearing their blue jersey? I know European do not entirely believe in superstitious but in a few game I watch France game they played and fortune well if they wear white jersey. Germany also have white jersey and they continue using it since white is the team marked, aside black away jersey. France come to quarter final against Germany after defeating Nigeria 2-0. Nigeria acted as home team and France as the away team. France wore their white jersey from Nike and the Super Eagle their green. Paul Pogba's goal and Yobo's own goal in the final minutes make the two team separate in luck. I mean luck because Pogba's head the ball to the empty goal because Nigeria goal keeper Enyama missed punch the ball. Germany on the other hand had to work hard to defeat Algeria. The strong will of Algeria squad to make history of defeating big names like Germany make Joachim Low squad could take advantage of extra time. Germany goals happen in extra time and if I am not mistaken the Algeria happen to wear white jersey. I know statistic counts nothing sometimes in the field but after seeing this France and Germany match, maybe team with white color jersey got more fortune than non white jersey. "Although our adventure in Brazil ends here and we're sad, disappointed and frustrated, we'll move on. "I hope this group of players can play together for a long time. I have a lot of work to do with them, but things are definitely promising. "Today, there wasn't much between the two sides. I thought we were a little bit timid at first and they scored early. After that, we showed promise. We created chances and could have been more clinical, but Manuel Neuer had a good game." "We played well, we played with a compact defence. They had some long balls against us but we did a classy job taking care of those. "Our midfield did a very good job disrupting their attack. We didn't have any organisation problems. "It was an incredibly exciting match but you can't expect anything else at the World Cup. Both teams were equals. Our team had fought hard to the end."